The predicament facing healthcare at present is the huge disconnect between doctors, patients and pharmacists that impacts most on the well-being of patients. The reality is that co-operation between doctors and pharmacists is vital in ensuring patient medication adherence. However, this does not always happen and the general practitioner, the gatekeeper to health, faces a daily administration nightmare in managing patients’ health outcomes. To address the issue, Marius van der Westhuizen, the chief architect and Product Manager of Intermedix South Africa, developed the iCanScript™ e-scripting solution. The result is that Intermedix has partnered with CompuGroup Medical SA (CGM SA), a subsidiary of CompuGroup Medical SE, one of the world’s leading medical information technology companies. CGM synchronizes healthcare delivery by developing solutions for healthcare professionals and has more than 400 000 customers worldwide. Intermedix now proudly offers iCanScript™, an e-scripting application developed in South Africa and powered by CGM SA. iCanScript™ is currently used by more than 1 000 doctors in South Africa and the number is growing. Following a patient’s diagnosis, a medical prescription is issued. The digital version of this process is known as e-scripting. The iCanScript™ e-scripting platform makes use of Advanced Electronic Signature (AES) for a quick, easy and secure prescription platform that streamlines the prescription process. Doctors can now create a digital script and sign it with a password or PIN using their personal AES. The patient then selects an e-script-enabled pharmacy from the doctor’s application, to which the e-script is routed. The pharmacist prepares the prescription and the medication is ready for collection. The doctor receives an electronic notification once medicine has been dispensed to ensure knowledge of the patient’s medication compliance. How is it legally compliant? Doctors go through a fingerprinting process authenticated by the Department of Home Affairs (See footnote.) before being issued with their personal AES certificate to use when digitally signing all their medical and clinical documents. Maimin continued, “There is a study that shows that there is a R12,5 billion (5,6% of total health expenditure) avoidable cost opportunity and that significant contributors to this are non-adherence and medication errors. Non-adherence is the largest cost, where, on average, a patient only fills 7 out of 12 prescriptions each year. Some don’t even fill the first one. With e-scripting one can see exactly what is happening with a prescription. For non-adherence, the avoidable cost opportunity is estimated at R5,6 billion – this is where patients don’t take their medication and end up in hospital or require other expensive interventions. Dispensing errors also creep in when pharmacists can’t read the script or misread it in terms of the actual medication or strength. With e-scripting there is no chance of a translocation error. iCanScript™ with AES is beneficial to doctors, pharmacists and patients alike. Doctors can be assured that patients receive the correct medication. In addition, access to detailed digital records will allow doctors to review historic prescriptions on a patient’s profile for quick review of compliance and re-issue of repeat prescriptions. The system is quick, safe and secure and confidentiality and integrity of digital scripts are guaranteed, as prescriptions cannot be altered once signed with an AES. Patient care is enhanced through the accuracy of digital prescriptions as pharmacists do not have to decipher what medication or strength was written on a prescription. Patients select a pharmacy of their choice for collection or delivery of their prescribed medication and the pharmacy prepares the script on receipt of the digital script. There is no more waiting in queues for the patient. There will also be reduced co-payments as the doctor, who has access to the formulary medication approved by medical aid schemes, can select appropriate medication that is approved by the patient’s medical scheme. For the pharmacist, there is improved workflow efficiency as a result of the automated delivery of the e-script into the pharmacy practice management system. There is also high-quality customer service as prescriptions and prescribed minimum benefits claims are prepared before the patient collects the medication. In addition, there is the potential for reduced medical errors as digital scripts are highly legible and require less typing input from the pharmacist when filling the script. 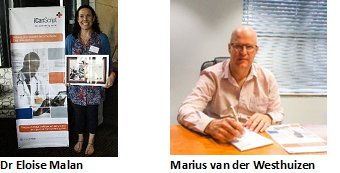 According to Marius van der Westhuizen, all parties in the health ecosystem are now for the first time connected and accountable as part of a multi-disciplinary team taking care of the patient’s health outcomes. He adds, “The patient is co-responsible for his/her healthcare and is involved in his/her healthcare journey, the pharmacist together with the patient drives adherence and the doctor can see what the patient is taking, leading to improved patient care and health outcomes. Dr Bruce Longmore, from Sizimpilo Medical Consulting in KZN, highlights another reason why e-scripting is a big deal and says, “Scripting is a critical part of the consultation process. Having the ability to access medicine databases and view generic substitution allows us to create legible, accurate and cost-efficient scripts. AES is the only way to protect the identity of the doctor and help combat fraud, waste and abuse in the healthcare sector.